Almost every crash is caused by unsafe driver behaviors. The first of a two-part webinar concluding on Oct. 5, listen to two pupil transportation consultants discuss how school bus drivers can make school buses even safer for the students they transport. Learn the logic and theory of how to raise safety practices and reduce accidents, setting the stage for the practical steps necessary to raise safety practices to the next level. Jeff Cassell, School Bus Safety Co. & Ted Finlayson-Schueler, Safety Rules! On May 2, School Transportation News will conduct a free webinar with REI and Fremont (California) Unified School District. This webinar will decipher the terminology and present guidelines to help participants evaluate and make more informed decisions about their school bus surveillance solutions. This webinar compares conventional fuels with alternative fuels, and shares why propane could be just the change your school bus operation needs. This webinar will review selected elements of an effective school bus operation management program. If you are new to the field of student transportation or are a student transportation director or school business official who serves as the de facto fleet manager in your organization, this webinar is for you. Do you need a powerful school bus routing solution as well as easily managed reports and districtwide access to transportation information for staff, administration and parents? Transfinder shares how its technological solutions can help. This free webinar presented by Safety Vision and School Transportation News shows you how to use unified security systems including video to improve safety at schools and on school buses. Experts from Cummins discuss various ways fleets can improve their operations. This free webinar covers tips on topics such as engine reliability, the importance of torque and improving efficiency. Monica Coburn, SafeGuard student transportation manager, shares how she successfully implemented lap/shoulder seat belts onto her school bus fleet and how student transporters can do the same in the wake of safety recommendations made by the NTSB. This webinar presented by School Transportation News and ROUSH CleanTech will focus on the cost-saving benefits afforded to school bus operations that switch to propane autogas, a clean-operating, domestically produced alternative fuel. A-Z Bus Sales, ADOMANI, and Blue Bird present a webinar answering your questions on electric school buses in California. Learn more about available electric technology, infrastructure concerns, necessary training, funding opportunities and real-world experiences with developing an electric school bus fleet—all tailored specifically to applications in the Golden State. With more and more states publishing their funding plans, the picture is becoming clear as to how the $2.925 billion Volkswagen Mitigation Trust Fund will make its way into stakeholders’ hands. Joe Annotti, senior programs manager for Gladstein, Neandross & Associates and a former U.S. EPA staffer, will identify the best opportunities for student transporters and how the industry stands to benefit from the funds. Join him during a free webinar on April 26 at 10 a.m. PT / 1 p.m. ET to learn about the latest information on this important emissions reduction grant opportunity. Register now for this free webinar about propane autogas school buses. You’ll learn about how propane autogas reduces emissions compared with diesel, how to get low total cost-of-ownership, and about the quieter operation of propane autogas. We’ll also discuss how to take advantage of the Volkswagen Environmental Mitigation Trust Fund for your district. The talk in transportation is always about having safe and reliable school buses. However, the reality is that finding the funds to purchase new buses to support safety and reliability has been increasingly difficult as capital funding has been more difficult to provide. With nearly $3 billion soon to be made available from the Volkswagen settlement, funding agencies are seeking new and innovative ways to deploy clean transportation solutions. This webinar will not only highlight key programs throughout the U.S. that fund new, cleaner school buses, but also how you can position your fleet to compete and potentially secure Volkswagen funding. All the talk today is about tomorrow and how automated/autonomous vehicles will impact the future. Often left out of the conversation, however, is the school bus – one of the safest modes of transportation. How will the technological change impacting cars and trucks impact school buses, and what can we expect in the future? Where automated technology is going is what this webinar is all about. The webinar will go further into detail about how propane can help schools meet their sustainability goals and remain profitable with reliable propane autogas. PERC’s director of autogas business development, Michael Taylor, will provide an overview of how propane buses are helping school districts and private contractors reduce emissions and lower their total cost-of-ownership. The webinar will also feature two users of propane autogas buses, who will speak about their positive experience with propane and how it has been a sustainable, profitable, and reliable fuel for their school district and/or organization. The objectives for this webinar is to increase awareness of the environmental and financial benefits of propane autogas. This one hour webinar will discuss various aspects of how terrorism relates to pupil transportation. Historical perspectives, current trends, and future forecasts will be examined. Bret E. Brooks is a senior consultant and the chief operating officer for the private training and consulting firm Gray Ram Tactical, LLC. He specializes in violence related issues and his research and training programs have been used and requested all across North and South America, Europe, Australia and the Middle East. Bret frequently speaks at national and international conferences, and has published numerous articles and books. He can be reached directly at bretbrooks@grayramtacticaltraining.com. Regardless of climate conditions, pre-conditioning your engine will extend the life of Diesel Particulate Filters, extending regeneration intervals and reducing maintenance costs and failures. DPF failures are costly. Learn how a DPF works and how it fails, and how to protect your fleet and save on these costly repairs. Attend this webinar to learn why propane autogas buses are the best choice for school transportation — lower total cost-of-ownership compared with diesel buses, scalable and affordable infrastructure options for convenient on-site refueling, and buses from all four major OEMs. The main goal of the Individuals with Disabilities Education Act is to teach independence and life skills to special needs students. But student transporters often miss the boat by not appropriately or adequately training this student population on how to best use the school bus to learn life skills, including bus safety. By following the lead of special education teachers, student transporters can help students with special needs with hands-on practice and demonstrations in the environment where they are best equipped to learn: The classroom. Learn how Cobb County Schools near Atlanta, GA upgraded its bus transportation communications and vehicle- and time-tracking capabilities with AT&T Enhanced Push-to-Talk with Integrated Dispatch and Actsoft® from AT&T. Children deserve a quality education, and this means they need to be able to get to and from school ready to learn. The School Transportation Network aims to provide possible solutions and strategies to overcoming the challenges society faces when attempting to provide safe, efficient and cost-effective transportation for the nation's school children. 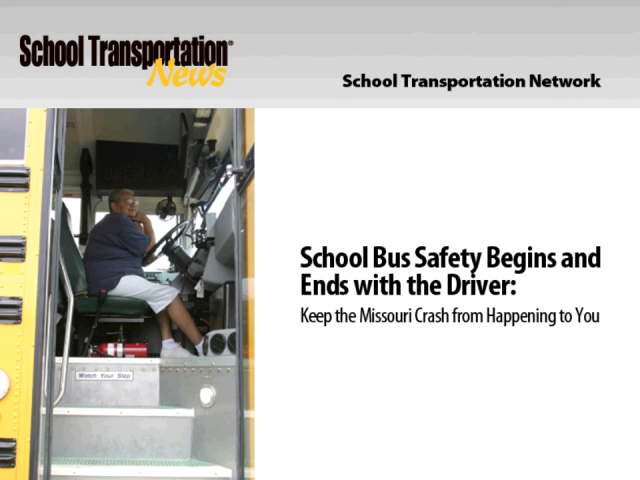 It is presented by School Transportation News, a monthly news and feature magazine that reports on current events affecting school districts, school transporters, educators, parents, public policymakers, and the private enterprise that support them. Webinar topics include transportation technology, alternative fuels, maintenance, management, operations and more. Presented by: Jeff Cassell, School Bus Safety Co. & Ted Finlayson-Schueler, Safety Rules!